I love "nail polish stickers". Generally, they are the answer to an uninspired day. And usually, they are dead easy to apply...unless you haven't cut your nails in a month. 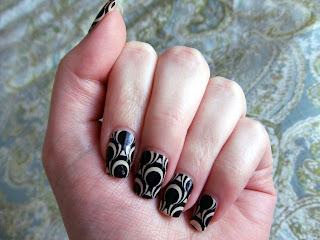 I could not get these Trend Tips by Sephora by OPI to work for me (by the way, this pattern is on sale for $5). I've used the Sally Hansen ones a bunch with good results, but never when my nails are this long. There was folding and tearing, and a fair amount of cursing. I managed to keep them on for about two days before I gave in and removed them. But damn if they don't look cool from far away. I hadn't either, to be honest. But I LOVE the design and they were $5. I think I'll probably stick to the SH ones from now on. They do look cool if you don't look too close. I had been eyeing this pattern for months. When it went on sale, I bought it. I used a couple of these on a friends nails (which were short) and they went on perfectly. Dunno. I was pretty disappointed. If one is prone to picking at nails, these sticker-things area a nightmare...or a godsend.